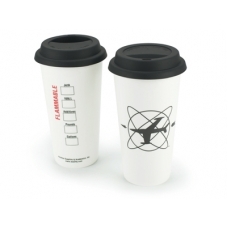 Double-wall insulated ceramic cup with silicone spill-proof lid. Keeps hot drinks hot and cold drinks cold! While proper fueling of an aircraft is important to any flight operation, so is proper fueling of the pilot-in-command (PIC). Long before the preflight begins, a PIC must prepare both mentally and physically to ensure fitness for flight. ASA recommends starting the process by filling the Auxiliary Tank with coffee, tea, or your favorite hot or cold beverage to help start the day and prepare for a safe journey. This double-wall insulated ceramic cup is emblazoned on one side with the same sleek "Standard" logo found on ASA logbooks for decades. On the opposite side is a convenient list of checkboxes for proper beverage labeling. The Auxiliary Tank will keep up to 16 ounces of hot drinks hot or cold drinks cold. The silicone spill-proof lid seals in place to help insulate and prevent the contents from escaping, and the cup and lid are both microwave and dishwasher safe.